I feel like I’ve heard this verse before. Probably never paid attention to 14-15, but it makes sense when paired with Numbers text this week. 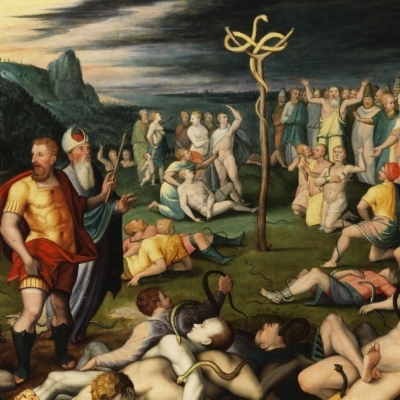 “Just as Moses lifted up the snake” is a clear allusion to Numbers text for this week. Just as the Israelites were saved from death by looking at the bronze snake in the wilderness (Numbers reading) so all people can be saved by looking to Jesus, but what does that mean? These divisions reflect a choice presented throughout scripture: separation in Creation; life in the garden/death outside; life on the Ark/death in the flood; life through the Exodus/death in the sea; Matthew 25- sheep/goats; etc. Life and Death- the choice presented to Adam and Eve (Genesis 2), given to the Israelites by Moses (Deut. 30) is once again raised by John. Not in terms of immortality or the quantity of life, but rather the quality of life. When we obey God’s commandments to love God, self and other - then we live life to the fullest. When we do not- this leads to death. Craig Kocher, Feasting on the Word - every church has it’s “Let’s go back to Egypt” committee: a group of people that will never be content with the present but want to return to the nostalgia of the past. A symbol of death is transformed into a symbol of life - it is not the “thing” in and of itself but the meaning we put on it. What symbols hold meaning in our lives? Interesting Side note: The symbol of the snake and the staff as a symbol of healing also appears in Greek mythology as the Rod of Asclepius (Asclepius being the Greek God of healing) and is used currently as a symbol of healing and medicine. The Israelites acknowledge that their sin was communal and subsequently their confession and repentance was communal as God’s grace. How do we raise the communal aspects of sin, confession and forgiveness other than a unison prayer in the service? Should we do more to acknowledge the communal sins of our churches and society in general and take responsibility? What are things that have been lifted up as examples or tools of God’s faithfulness that have become idols in their own right? What Bronze snakes live in our temples that need to be broken and discarded? A LOT is said in this short passage. Disputed author. Perhaps the most deeply contested of Paul’s letters. Good arguments can be made on both sides of this debate. Disputed audience. The phrase “in Ephesus” seems to be added at a later date. It seems as if the letter were intended to be a circular - shared by many communities addressing problems that were facing many of the early communities. Namely, the rapid growth of the early church among Gentiles and existing as subjects of Rome as well as subjects of Christ. “A great benefit of the letter’s general character is that it gives us a good summary of Paul’s basic understanding of Christian thought and Christian living.” (Timothy Gombis, Common English Study Bible notes on Ephesians). You cannot separate Paul’s teaching from the community. This letter was meant to be shared with many communities, not individuals. The idea of sin and salvation is one for the body of Christ, not individual believers. 1-3 is the past - a Gentile people who pursued nothingness. I prefer “Children of Wrath,” because this implies that the people were going to get exactly what they pursued. When you pursue nothingness, or the way of the world, your reward is of the world. It is not that God actively punishes those children, but that they justifiably achieve exactly what they are pursuing. Important note - the “US” language, this is first person plural. God’s love and Christ’s salvation happens in community. Paraphrase: The God of love made us alive in Christ while we were dead in sin. That is what grace is. Where is your starting point? Dead in sin, or alive in Christ? Some say you can’t be made alive in Christ until you realize that you are dead in sin (rock bottom). Say the sinner’s prayer, and then you’re alive. Some say that I am alive because of God’s love, and realizing that God’s love comes even in the midst of my sin brought me back to life. Respond to God’s love with love. V. 7-10 pushes the story into the future. We are God’s poetic work. All of Creation is God’s poetic work - remember the poem of Genesis 1. In other words, we are God’s work of art, created to do works (of art?). V. 10: We are God’s created to do good work. By God’s grace, we were created to create goodness. When do we create goodness? How can the Church provide ways for people to be fully alive? In service? In arts? In worship? In generosity? In friendship? The hinge verse is 4a “But God who is rich in mercy.” All things flow from this truism about the nature of God. God is rich in mercy, and puts an end to the death to which we cling. Grace begins with God’s mercy even while we are pursuing other things.